Most people who have ever seen a physical stock certificate can hardly deny its beauty. Many are a work of art with scenes of Greek gods sitting on thrones, muscle bound guys holding up the world, cityscapes of New York, or even our favorite cartoon characters. But, many people do not realize that stock certificates can be highly collectible. In fact, there is even name for the hobby of collecting old stock and bond certificates. It is called scripophily, pronounced “scrip-ah-fully”. Like baseball cards, antiques, and beanie babies, stock certificates are collectible because they are rare. More and more stock certificates are fading from the financial landscape of America. Public companies are starting to transition to a complete computerized system of registering stock owners. Even stock holders who have shares issued in their own name instead of holding the stock in street name with a broker find themselves without a stock certificate more and more. There are a few unique things that collectors of rare stock certificates look for when hunting down a special certificate. Some collectors look for stock certificates that have not been cashed in and cancelled. If there are perforated dots punched into the face of the certificate, then those shares of stock were redeemed at one point or another. Shares that have never been redeemed in a company that has gone bankrupt are slightly more collectable. A collector can also look for stock certificates in companies that are no longer in existence because of scandal or some other intriguing story which adds to their collectible appeal. Collectors sought out share certificates of Enron with computerized copies of Ken Lay’s signature, the infamous company’s CEO, after that company’s collapse. Many collectors who practice scripophily look for not only the beautiful stock certificates but also the ones from companies that tell a story about America’s rise to become a capitalist superpower. There are plenty of companies that tell America’s business story through the good points and bad. Certificates can be found that tell of American business triumph about companies led by great business leaders such as Rockefeller and Carnegie, and the stock certificates can also tell tales of tragedy for a business or even an entire industry such as the railroad industry of the late 1800s and early 1900s. Stock certificates are a beautiful works of art, and scripophily is the interesting hobby of collecting them. Whether you love them for their pictures of a bygone era or for this history or for their infamy, stock certificates are an interesting fabric of American business culture and the financial markets’ history. With more companies changing how they issue stock certificates and some discontinuing to issue them, scripophily will only increase in popularity as these stock certificates fade away from the way we buy and sell shares. 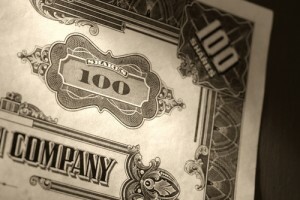 Feel free to take a look at Scripophily.com ( http://www.scripophily.com ) which shows over 16,000 stock and bond certificates. You are absolutely right. I love your website and have been a fan/reader for years now. I highly encourage everyone to check it out. Thanks for the great site and the service you provide to us collectors.